Mix’n’Match is a game that allows you to produce your own content for all school subjects within the pre-set frame, namely that it has to be something that matches in pairs. You can increase or decrease the level of difficulty when you make your own games in Mix’n’Match. Thus, you can use the game all the way up the school system, from preschoolers to lower secondary education. You can play Mix’n’Match in Danish, English, French and German, and you have the option to choose between the preprogrammed games that Hopspots has made, and all the games that the Hopspots users have made. Mix’n’Match is an active memory game that combines sounds or music with images and bodily movement. The children pick a game e.g., the preprogrammed game with capitals and countries. They step on a random spots and now they will hear either the name of a capital or a country, and see images of the city and the country’s flag on the iPad-screen. The children then step on a new spot with a new sound and image. As the game progresses, the players’ job is to rememeber the different spots’ capital, country and position to match the most pairs. A match could for instance be “London” and “England”. Children can make their own pairs and produce games for relevant school subjects and topics using the record- and camera functions in the iPad. In that way the children become digital co-creators of learning content, learn to programme and adjust the level of difficulty to suit their own academic level. You can activate the entire class all at once if you divide the class into groups that each produce games for each other e.g., during the math lesson. 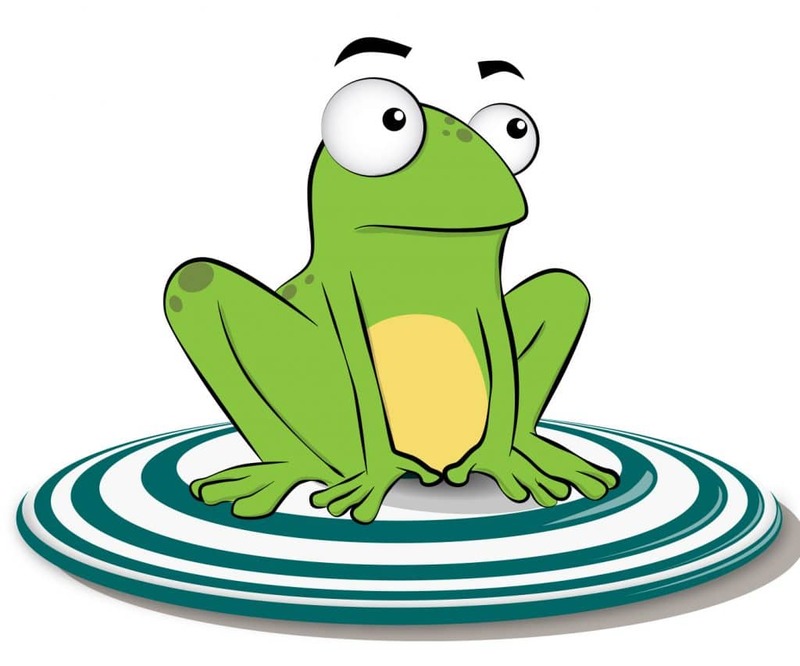 Each group will take turns at playing the game using Hopspots, while the groups that are not playing will be working on making relevant games in the app. Hopspots takes less than 5 minutes to set up, and after that you just have to enter Mix’n’Match, where you can choose between the preprogrammed games or produce your own fun and educational games for the different school subjects. You can easily record your own content in Mix’n’Match thus no matter what you choose you will be playing with Hopspots and games targeted to your specific teaching in no time. The teacher can produce games for the pupils ahead of teaching or include the pupils in the process, giving them a sense of ownership over the game and making them digital co-creators of learning content. Mix’n’Match can also be used for a lot of different things in math. One example is additions that add up to 10 for the preschoolers. Step on one spot and hear “7” and then find the spot that says “3” to match a pair. For the older pupils it could for instance be an equation on one spot and its solution on another. Mix’n’Match is also highly applicable in the language subjects as you can set the feedback in the games to be in Danish, English, German and French. That means that if you make a game for a class in English, where one spot says “He”, and you have to find the spot that says “is” to practice your grammar, you can get the feedback in English when you play. The feedback will for instance be “It’s a match”, when you match a pair – and in that way the entire game is played in the foreign language you have chosen. In the same way you can play in French and German thus you can make grammar, translation, question- and answer games about specific topics etc. For German classes you could have “Head” and “Kopf” as a pair, and for French e.g., “Je m’appelle…” and “My name is…”. 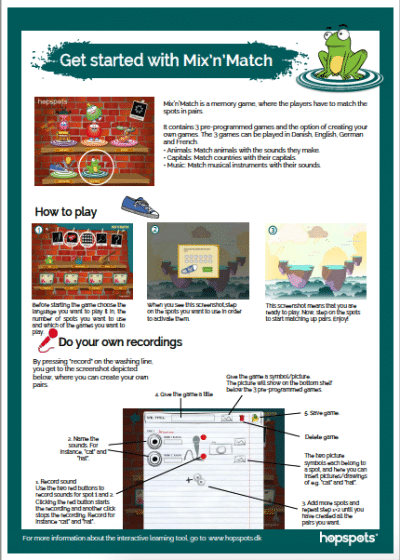 As mentioned above Mix’n’Match can be use in all school subjects and levels as you can produce your own game content. For science subjects it could be “H2O” and “Water” as a pair on the spots. For History and Society subjects you can for instance use the game to learn about new topics or repeat some that you have already been through. It could be question- and answer games as e.g., “When was the Second World War?” and “1939-1945”. 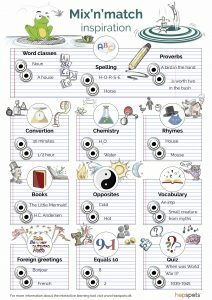 You could for instance make a spelling game with one spot saying “H-O-R-S-E” and then the pupils’ task is to find the spot that says “Horse”. It could easily be harder – your imagination is the only limit in Mix’n’Match. You could step on one spots that says “Noun”, and then try to find the one that says “House”, or even harder “What is a Robinsonade?” and then try to find the spot with the answer to the question. Let your imagination run wild abd get started with making your own pairs to create targeted teaching combined with movement. Here you will a guide that step by step shows you how to play Mix’n’Match and a template you can use when you want to make your own pairs.